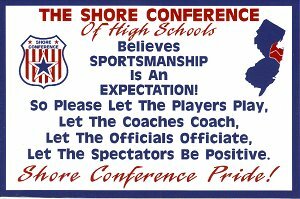 Posters, signs, artificial noisemakers and other devices shall be barred from all Shore Conference events. 1. Attempts to understand and be informed of the playing rules. 2. Appreciates a good play no mater who makes it. 3. Cooperates with and responds enthusiastically to cheerleaders. 4. Shows compassion for an injured player; applauds positive performances; does not heckle, jeer or distract players; and avoids use of profane and obnoxious language and behavior. 5. Respects the judgement and strategy of the coach, and does not criticize players or coaches for loss of a game. 6. Respects property of others and authority of those who administer the competition. 7. Censures those whose behavior is unbecoming.